Chef Brandon McGlamery shares favorite recipes from the kitchens of Luma on Park and Prato, along with stories of Florida farmers and fishermen. "Like his thoughtful tasting menus, Brandon McGlamery's 9 COURSES showcases his originality while celebrating tradition and refined technique. 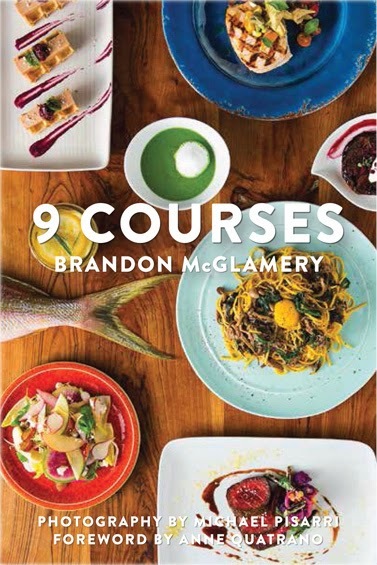 Its recipes, rich in imagination, are also filled with straightforward and insightful guidelines like McGlamery's "9 Rules of the Road" which serve as a blueprint for the book and your kitchen. You’d do well to circle Rule #9, which directs you to "have fun, smile often, eat well" — with McGlamery as your guide, that’s all but guaranteed." "9 COURSES is an important contribution to the cookbooks of Florida, the American South and across the U.S. It proves once again that we in Florida have a very rich and delicious place to cook from... and call home."